Now, I often accidentially plug my USB 3.0 storage devices into USB 2.0 ports and only notice when copying takes a long time. It would be nice to get a similar warning in this case, and according to a Google search, some people do get a warning message. Just to be clear, I'm using Windows 10 (fully updated as of Jan. 2016). I have both USB 3.0 and USB 2.0 ports, Windows recognizes both as such. I tried a USB 3.0 stick/pendrive and an external hard drive, and I tried it on my laptop and my PC. In all cases, I get slow speed on the USB 2.0 ports and high speed on the USB 3.0 ports, but never a warning in the low speed case. In the "Devices and Printers" window, when I select the USB 3.0 Drive, it actually says "This device can perform faster..." in the info area. What I'm looking for is the setting "Tell me if my device can perform faster" that used to be present in Windows 7, but it seems the GUI to toggle it has been removed. Is there any way to (re-) activate this warning? This appears to be hardware driver specific, and not necessarily OS specific. See here. As a side note, most USB 3 ports have a blue connector color, and USB 2.0 is black. That's not a standard, but in all the computers I've used in the past 18 months or so, that holds true. Another possibility (and this is driver specific): Open the Device Manager (type Device Manager into the Start menu and press Enter), right-click the USB host controller under Universal Serial Bus controllers, and select Properties. Check the Tell me if my device can perform faster check box on the Advanced tab. Again, some drivers will have this and some won't. If your computer came with specific motherboard drivers, those would be the ones to use. I think that getting that message may not be as simple as changing a setting or notification preference. Maybe 3rd party software that can trigger a message or window popping up to report the status of a USB device that was recently attached. My first thought, that is hopefully relevant but not perfect, is that what you are seeking may require a program that can actually test the status and performance of a USB connection and then report that to you automatically shortly after a usb data storage device is connected. My second thought is that you ask yourself if a report of the actual performance is what you really should be seeking regardless of how a USB connection is negotiated between the host and the device. Many of those variables can even force a 3.0 device to negotiate and be used as a 2.0 device or perform like a 2.0 device. A drive performance utility could be useful or even necessary to actually know the performance you are getting. 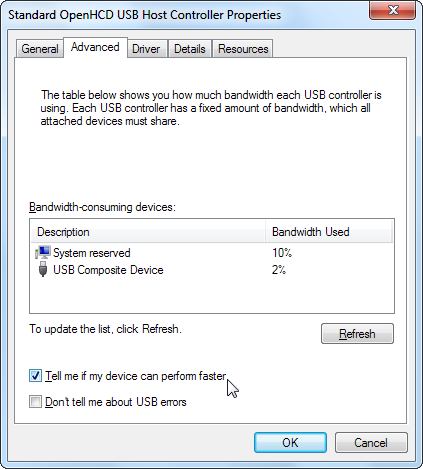 A usb 3.0 device telling you it connects as a usb 3.0 device doesn't tell you how it is actually performing. From what your asking, I am going thoughtfully and politely suggest that you decide if you actually desire a confirmation of performance rather than merely a conformation of the usb 2.0/3.0 connections status? It is a microsoft utility called "USB View" that gelps you: "Map and troubleshoot your USB ports"
I doubt Windows 10 has this option built in, but I have seen 3rd party USB3 utilities pop up with a dialog. Sometimes USB3 sockets aren't marked because all the sockets are USB3. When they're not, they're either marked blue or also sometimes marked with "SS". Some sockets are powered even when the machine is off - these usually have a little lightning bolt next to them. In Device Manager, check if Intel USB Host Controller 3.0 is enabled and updated. Go to BIOS settings to see if USB 3.0 is enabled. If you are still facing the same problem, try uninstalling all USB host controllers in Device Manager. Note: Make sure you are not using any extender for USB. I have had this issue before, after buying a Jumpdrive on amazon from an unreputable source. 'IF' you are in fact using a USB3.0 Jumpdrive and are plugging this into a USB3.0 Port you should not have any notification or issue. Anything you are experiencing to the contrary means one of those two things is not compliant. Simply put you should check your Jumpdrive and make sure it is actually a 3.0 device. It sounds like you may have been mislead by false advertisement or the device is being plugged into a 2.0 device. Regarding the speeds you are receiving; you will always be limited by the transfer speed of the host device. Jumpdrives in most cases "Theoretical Limit" vastly exceeds that of what HDD's are capable of. USB 2.0 is capable of data rates up to 480Mbps, but most hard drives cap at 20-40Mbps, in laptops with a HDD of 5600RPM. Not the answer you're looking for? Browse other questions tagged windows-10 usb-3 or ask your own question. multiple USB 2.0 devices faster on USB 3.0? Why is there a speed increase when using a USB 2.0 device with a USB 3.0 port?